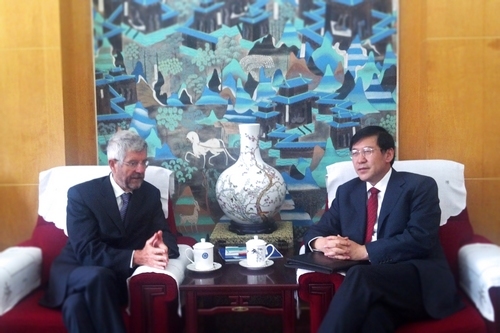 On Sept 13, YIN Hejun, Vice President of Chinese Academy of Sciences, met with Professor Giovanni Fabrizio Bignami, COSPAR President, at the headquarters of CAS. Both parties exchanged opinions on the concerned issues. Professor WU Ji, Director General of NSSC, and WANG Zhenyu, Division Director of Bureau of International Cooperation, attended the meeting. YIN Hejun introduced the work of CNCOSPAR and the long cooperative relations between CAS and ESA, and ESA’s member states such as France and Italy. YIN Hejun briefly talked about the Strategic Pioneer Research Project in Space Science, the KUAFU Project and Hard X Ray Modulation Telescope Project in particular, and related cooperation in those projects. Professor Bignami extended two proposals to establish cooperation making full use of the platform of COSPAR and to build cooperation between relevant institutes in CAS and institutes in Italy such as Italian National Astrophysics Institutes. YIN Hejun said that there were numerous opportunities for cooperation between CAS and COSPAR and relevant institutes in Italy. The Secretariat of Chinese National Committee for COSPAR is affiliated to National Space Science Center. CNCOSPAR has carried out a quantity of activities related to COSPAR, and a COSPAR Capacity Building Workshop on Remote Sensing of the Global Water Circulation to Climate Change is hosted by NSSC from Sept 3-14.